Sithonia, the middle peninsula of Halkidiki attracts tourists primarily for its beaches. What many don’t know is that mountainous Sithonia is a spectacular place to come in the off-season for hiking. Mount Itamos is the highest peak on Sithonia, reaching a height of 811 meters. 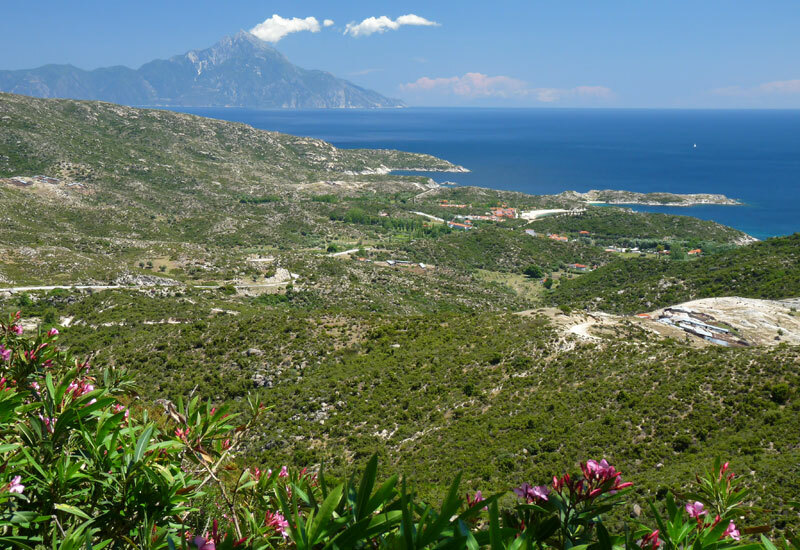 From here you can enjoy panoramic views over the whole peninsula with an amazing bird’s eye view of Mount Athos to the east and Mount Olympus in the west. 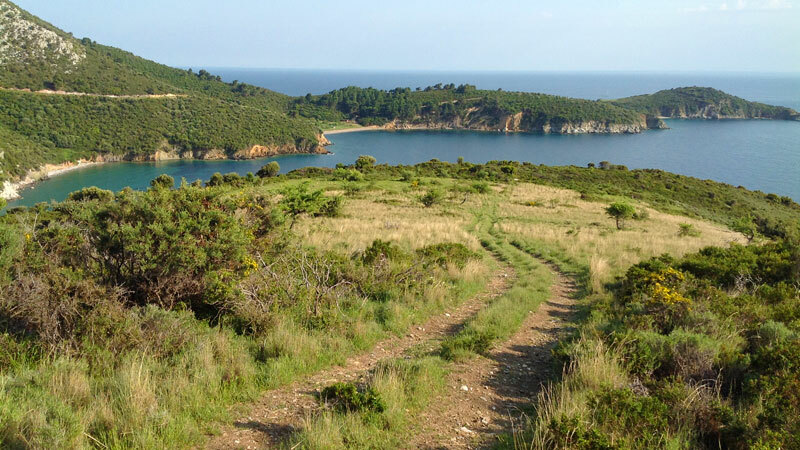 The peninsula is very green as it’s covered with olive groves and pine trees. The relaxing mix of blue sea and greenery makes Sithonia a rewarding destination for an active hiking or cycling vacation. Several walking trails exist but the last years some have fallen in disrepair and not so easy to follow. Some of the trails still have the marked sign of a “triton” (Neptune’s fork) or are painted on trees and rocks to guide you. In the “Halkidiki Walking Guide” by David Ramshaw you can find more details and many of these hikes we include on this website. Most of the hiking trails are self guided and follow goat paths. They are not difficult if you are a seasoned hiker, but can be challenging for those who are not experienced hikers. Other shorter hikes can be enjoyed by families with children. Where we include a recommended time to complete a hike, we take into consideration that you may take breaks to enjoy the nature and stop for photos. Experienced energetic hikers may complete the hikes in half the time that we recommend. Thinks to keep in mind to get the most of your hiking and to avoid the pitfalls. In the summer months the sun is too intense for serious hiking. 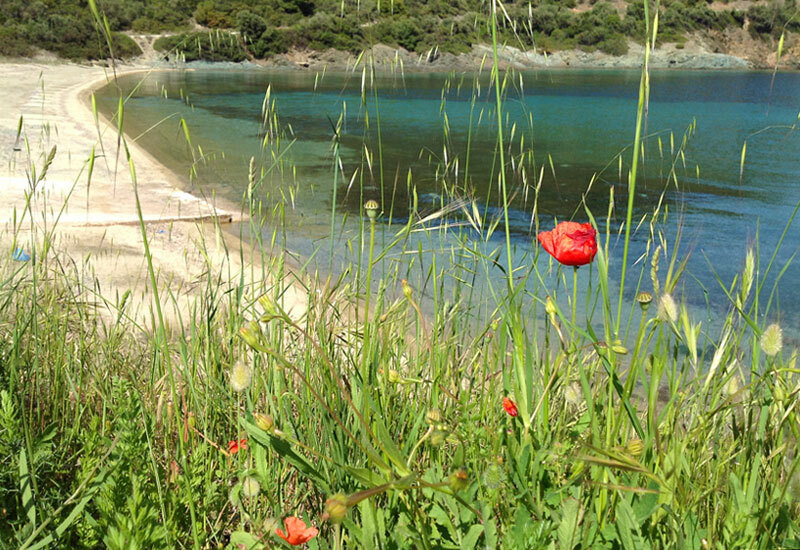 There are some trails that will bring you to out of the way beaches and are not difficult to hike, but as a general rule we recommend spring or autumn to come to Sithonia for hiking. In May the weather is already warm and the spring flowers are out so hiking is an enjoyable experience. The only setback would be if it rains. In September the weather is usually ideal to hike as the conditions are dry. It still may get quite hot but after mid September the weather normally cools down. In September the sea is still warm and is the perfect time to go to Sithonia if you want to enjoy both the trails and the beach. April and October, or even any other month, can be possible for hiking if the weather permits. Facilities such as hotels and restaurants are usually already closing up for the season, but there are some who remain open all year. The normal danger is heatstroke from the intense sun. Dogs Yes there are wild dogs and recent years has seen some dog packs. Don’t hike alone and better yet, hike in a group. Snakes Sometimes they will appear on the trails in the morning as they warm up in the sun. Normally they are not a bother, just stomp loudly and they will run from the vibrations. What should I bring on the hike? Good footwear is something that is appreciated on all the walks given on our website. Halkidiki involve climbing over rocks. Because of the intense sun, it is easy to get a burn in Greece. If you are out in the mountain or on the trails, some areas offer little chance for shade. So play it smart, and don’t let a sunburn ruin your vacation. On most of the trails there are no water sources. Be prepared to bring enough water with you for the day. If the path leads to a village, then you can fill up there and sometimes there are fountains that allow you to refill, but don’t count on it. As with water, there usually aren’t any shops on the way, so bring something to keep you going for the day.